The book of the genealogy of Jesus the Messiah, the son of David, the son of Abraham. This Gospel is big on fulfilment and these two Old Testament figures take a prominent place in its opening because Jesus is being portrayed as part of a much bigger story. In the last post I looked again at Jesus, Son of Abraham. This post looks at Jesus as the Son of David. Whilst God’s promise to Abraham was the Covenant Promise of Life, David was given a Covenant Promise of a Righteous Kingdom and King. At the time of King David, the promises to Abraham had been playing out in the lives of the patriarchs for centuries. The Israelites had increased in number, even in slavery in Egypt, and had made their Exodus to Sinai to become a nation under God, formed around another covenant, the covenant of Moses (which serves the deeper purposes of the promise to Abraham). The nation had taken possession of the land which God had promised, and had appointed kings. Kings had come from Abraham – as had been promised. The promises to Abraham were now held by a political, military, nation-state, which could hope for peace and prosperity under its king; who exercised authority over injustice and evil, and protected his people from harm. The Kingdom of God was established on earth, a mustard seed, a small beginning. And all within the context of the worship of God the King in Jerusalem. In the heady days of David’s reign, God made a covenant with him. The Lord declares to you that the Lord himself will establish a house for you: When your days are over and you rest with your ancestors, I will raise up your offspring to succeed you, your own flesh and blood, and I will establish his kingdom. He is the one who will build a house for my Name, and I will establish the throne of his kingdom forever. I will be his father, and he will be my son. … Your house and your kingdom will endure forever before me; your throne will be established forever (2 Sam 7:11-16). This is the Covenant Promise of a Righteous Kingdom and King, through which the Covenant Promise of Life would be realised. The Kingdom of God, on earth. Of course, David’s kingdom declined; compromised, messy, fatally flawed. David’s days ended. He was not the king who could make the Covenant Promise of Life a reality. Yet the hope remained of the ultimate king, the Anointed One, the Messiah, who would bring the Kingdom of God and its peace, whose throne would be established forever. Every warrior’s boot used in battle and every garment rolled in blood will be destined for burning, will be fuel for the fire. And he will be called Wonderful Counsellor, Mighty God, Everlasting Father, Prince of Peace. He will reign on David’s throne and over his kingdom, establishing and upholding it with justice and righteousness from that time on and forever. The zeal of the Lord Almighty will accomplish this (Isaiah 9:5-7). As the years went by, hope faded. The nation was divided under compromised kings, exile followed. Even after the return to the land, the decline continued, until under Roman rule, the hope of God’s kingdom seemed as far away as ever. When would the Messiah appear, to bring in the Kingdom of God? At the beginning of his Gospel, Matthew is clear. Jesus is the Son of David, Jesus is the Messiah: ‘This is how the birth of Jesus the Messiah came about…’ (Matthew 1:18). After Jesus is crucified, his credentials as the Messiah are in tatters. But, his death turns out to bring life and forgiveness. And, at the end of the Gospel of Matthew we again find the theme of Fulfilment. We find the resurrected, living Jesus speaking these words, “All authority in heaven and on earth has been given to me” (Matthew 28:18). The Messiah is alive. Not only that, but the Messiah is Mighty God as well as being human. In the Messiah, God has become King. His house and his kingdom will endure forever. Of the greatness of his government and peace there will be no end. He is bringing in the Kingdom of God through salvation, and through judgement. And that’s important. Because this is all history. A real story. And you’re in it. The genealogy that follows makes a big play on these two Old Testament figures and the fact that Jesus is descended from them. They are picked out by Matthew because God made covenants with (gave promises to) each of these figures. Matthew wants to show in his gospel that Jesus has fulfilled these promises – that Jesus is completing the story. We didn’t have too much time to look at the texts involved, so I’m posting briefly on ‘Son of Abraham’ now – with ‘Son of David’ to follow. The promises have to be understood against the story of Genesis up to that point. God’s good world has descended into violence because of human sin. The relationship between humanity and their creator, the essence of true life, is broken; tribes and clans are at war; survival is difficult, land is precious (read chapters 12-16 to see all this playing out). Against this backdrop, God speaks to Abram, an everyday Chaldean; speaks promises which will change the course of history, which will see the original intentions for humanity recovered through the redemptive power of God. The promises to Abraham (as re-stated to Isaac and Jacob) are a re-affirmation of the primal divine intentions, not a replacement intention. 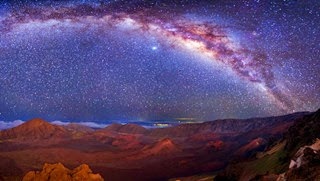 They affirm God’s intention for humanity to live in a good world, in relationship with their Maker. These are Covenant Promises of Life. It’s fascinating when we get glimpses of this theology in these early narratives, such as in Genesis 13:10, where the fertile Jordan valley is described as being like ‘the garden of the Lord’, a reference to Eden, the primal Secure and Fruitful Homeland. These Covenant Promises of Life are, to the New Testament writers, fulfilled in Jesus Christ. He has come to make these promises a reality. They are not to be ‘spiritualised’. For how this plays out in relation to the promise of A Secure and Fruitful Homeland, see here. As the Old Testament story unfolds, these promises become concrete in the formation of the nation of Israel, who worship Yahweh their God, the God of Abraham, Isaac and Jacob, in the land of Israel. The family-faith of Abraham becomes political state, securing its borders and seeking to achieve a society of righteousness and peace. God’s promise to Abraham about kings (17:6) is realised. But, it’s a messy, compromised, interim state. The vision is never realised, and any hope seems to ultimately be buried under failure. But, this is the way that the recovery of those original divine intentions for humanity unfolds. It is, to coin a phrase, the Extraordinary in the Everyday. Into that story, at its lowest ebb, comes a baby born as the Son of Abraham, and the Son of David (that’s the next post). After the story that unfolds in the Gospel of Matthew, of Jesus’ birth, life, teaching, death and resurrection, we find him alive, commanding the good news to be taken to all nations. In Jesus, the Son of Abraham, the Covenant Promises of Life are taken world-wide – all the nations of the earth shall be blessed, counted righteous through faith in him. And that’s why we are his disciples. And why we are part of a vast number of disciples, like the stars. Notes: 1. David J.A. Clines, The Theme of the Pentateuch, JSOTS 10 (Sheffield: JSOT Press, 1978), 30, emphasis added. 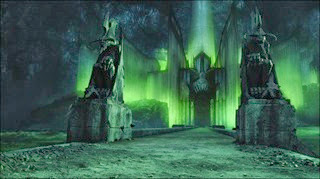 The ‘gates of Hades’ is a mythic image of a barrier between the underworld and the land of the living. The Gates of Hades prevent the dead from returning. The image represents the irreversible power of death. However, Jesus’ words express his confidence that death will not prevent God’s purpose for a redeemed people (the ekklesia of Jesus), living in a redeemed world from being accomplished. The Greek inscription that adds weight to my interpretation appears to be anti-Christian polemic from the early years of the Church (Lattimore, Themes in Greek and Latin Epitaphs, 75). 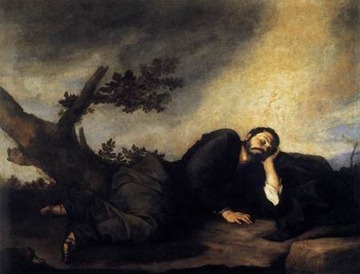 It expresses the common ancient view that death is the end – there can be no return to the realm of the living – and paints the Christian hope of resurrection as a fantasy. This, friends, is it. For what more could come afterward. Not even this remains. For it is the stone and stele that tell you all this, not I. The gates are here, and the trodden ways to Hades by which none can come back to the light. But all pitiful wretches (long) for resurrection. The important point is that, again, gates are portrayed as preventing a return to life for the dead. Perhaps just as important is that here in this inscription, the imagery is linked specifically with the hope of resurrection. It’s the same imagery that is found in Homer and in the Sibylline Oracles. This is the imagery that Jesus employs: the power of death over the bodies of the deceased will be broken. The grave will not overpower the Church. Matthew has Jesus speaking of Hades, not hell. It’s most likely (despite the word play on Πέτρος/πέτρα) that Jesus speaks in Aramaic here, so the Greek word Hades (ᾅδης) is a translation of Aramaic. Hades therefore represents the Hebrew view of Sheol as the grave, the destination of the dead. Jesus is not referring to a place of eternal punishment here. Translations of Hades as hell often lead to confusion. This emphasis on the necessity of the defeat of death through resurrection reminds us that the Church, the ekklesia of Jesus, is not merely something for this life, an organisational necessity whilst we wait for salvation. The ekklesia is the People of God, an entity destined for a new earth. The ekklesia of Jesus is not merely a spiritual reality, but a physical reality (this dichotomy is not very helpful, but it’s how most Christians tend to think). The human being as human being (body and soul) is the object of God’s redemption. The ekklesia of Jesus is finally an eschatological reality. God’s people are not destined for a ‘spiritual’ existence in heaven, but a salvation that involves the redemption of the human body. Membership of the ekklesia is mediated through the sensory experience of the human body. Death interrupts this. Only at resurrection do we take our place finally and fully in the ekklesia of Jesus. All this has implications for ecclesiology and offers a cogent challenge to the Protestant concept of the invisible church (and the related idea of a spiritual, as opposed to visible, unity). Can there be such a thing? Or seizing him I will hurl him into misty Tartarus, very far, where is the deepest gulf below earth; there are iron gates and brazen threshold, as far beneath Hades as sky is from earth. Zeus speaks of the gates of Tartarus, far below Hades. The idea seems to be that there can be no escape from Tartarus – there is no way back to Hades, let alone the heavens (for it is other gods that Zeus threatens to cast down). Tartarus was part of a specifically Greek conception of the underworld. As an interesting aside, Tartarus is mentioned in 2 Peter 2:4, not as the destination for troublesome gods as in the Iliad, but as the destination for fallen angels. However, that must remain an aside. In the Iliad, the gates of Tartarus prevent escape. In the Sibylline Oracles above, the gates of Hades are broken down in order to release the dead for judgement. The emphasis in the Oracle is clearly on the raising of the bodies of the dead. 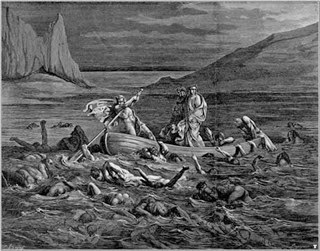 Those who are raised include Old Testament saints such as Moses, those killed in the flood, as well as Titans and giants (2.231-248)! Although the late date of the Sibylline Oracles places them after Jesus’s words, the emphasis on gates preventing the dead from being raised reflects the much earlier Homeric portrait in the Iliad of gates preventing the cast-down gods from returning to Olympus. So, it seems to me that Matthew 16:18 is not really about evil powers frustrating the work of the church in the here and now (the most common interpretation of the verse), but about the victory of God’s people over death through resurrection. Jesus is building God’s new humanity, the church, as a people who will live human lives as human beings, body and soul. The church is a people destined for new life in a new earth. The reality of death will not defeat this purpose. Jesus, when he speaks these words to Peter, voices his mission: he has come to defeat death and to raise the dead – to save people body and soul. 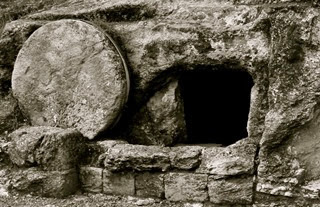 He rises from the dead to eternal life – and God’s people too will rise from the dead to eternal life. The fact that no-one has returned from Hades when Jesus speaks these words is about to be over-turned on the first Easter Sunday! Those words, and those preceding them (‘when I was in prison you visited me’, etc.) often cause consternation because it is the deeds of those who showed kindness that are the basis of the Father’s judgment. The words are not easy to understand. ‘When I was thirsty, you gave me something to drink…’ Do these words mean that Jesus is present in everyone? Or do they only refer to good things done to other Christians? Is it all good deeds, or only those things that are done to Christians that matter in the judgement? I think the answer lies somewhere in between. The New Testament teaches the truth of the identification of Jesus Christ with his people through the concept of union with Christ. 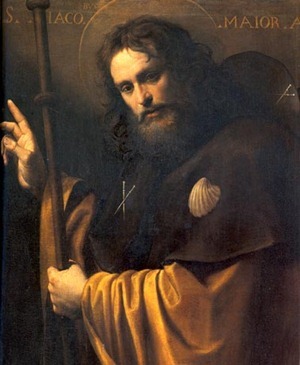 The apostle Paul often portrays Christians as being ‘in Christ’. And this ties in with the words of John 15, where Jesus speaks of himself as a vine and of all Christians as being incorporated into him as branches, either fruitful or unfruitful. When we meet one another’s needs as Christians, we are showing kindness to Christ himself. There’s a great story about Martin of Tours, a Roman soldier who was a Christian back in the 4th century, when Christians were in the minority. Walking in Amiens one day, Martin encountered a beggar by the side of the street in the freezing winter conditions. Martin stopped and used his sword to cut his large, thick officer’s cloak in half, giving a now ragged-edged half to the beggar to keep him warm. That night, Martin had a dream. 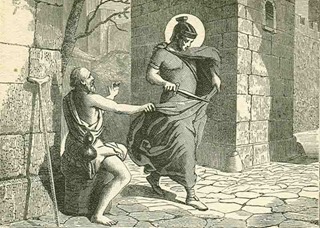 In it, Jesus appeared wearing a ragged-edged military cloak. 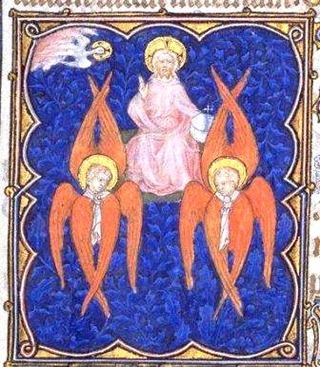 ‘Who gave you that cloak?’ asked one of the angels. ‘My friend Martin gave it to me,’ replied the Lord. It’s a moving story and a great illustration of Matthew 25. I don’t know if the beggar in the story of Martin of Tours believed in Jesus when Martin met him, but if he didn’t perhaps it was Martin’s simple kindness as a Christian soldier that showed him the way to faith. Those who we do good to might not yet be identifiable as Christians, but the very act of kindness that we do might be the reason why they come to follow Jesus in faith. It is entirely possible that the one receiving a cup of water, or food, or clothes, or a visit is not a Christian when they receive from us, but at the judgement they will be counted as ‘one of the least of these’ because the kindness they received helped to bring them to faith. In that case our kindnesses were to Christ because they were to one of his own. Does Matthew 25 give any basis for the church organising mercy ministries? I believe it does. A right understanding of Matthew 25 motivates mercy ministry to all. Earlier this year, I prepared some of my work on John 1:51 for publication. The resulting article, entitled ‘Heaven Opened: Intertextuality and Meaning in John 1:51’, is about to be published in Tyndale Bulletin (issue 63.2). It is the incarnation of the logos, the addition to the nature of the logos of a human nature (a human body and soul) that brings Jesus the person into being. The logos has an eternal divine nature, and so has always existed. But the logos is not Jesus. The name Jesus (or Yeshua, as Jesus’ family and friends would have called him – Joshua to you and me) was given to him at his birth. Jesus is a human being. Jesus did not exist before his birth. Isaiah did not see Jesus in the temple. Only marginally better, but in my opinion usually misunderstood, is the term ‘the pre-incarnate Christ’. Some may argue that what Isaiah saw in his vision was the pre-incarnate Christ. But again, Christ – or Messiah – is a title bestowed upon a human being. It is not a title of the logos, it is a title of Jesus. Jesus is the Messiah. The logos is not the Messiah. The terms ‘pre-incarnate Jesus’, or ‘pre-incarnate Messiah’ might be used to mean the logos, but are somewhat misleading, if not given careful definition. There can be no simple identification of the logos as the pre-incarnate Jesus, or the pre-incarnate Messiah. There was a pre-incarnate logos – and that expresses the most important point, and therefore is the term which ought to be used. A whole mythology has grown up about where Jesus (or Christ) can be found in the OT – standing on the banks of the Jordan with Joshua, wrestling with Jacob, sitting in Abraham’s tent. Even if we allow that the logos is meant, it is far from clear that the logos could be manifest in isolation from the Trinity (apart from in the person of Jesus Christ, the image of the invisible God). Why does all this matter? Some would say that it is needless theological precision. I beg to differ. Too many Christians believe that Jesus has always existed. That, in a nutshell, is a denial of the incarnation. If Jesus is actually a spiritual being who slotted into a human ‘shell’, then he is not actually human (it’s the old Apollinarian heresy). To cut to the chase, you can see the theological fallout from this mistake in the effective silence about resurrection, and about the worth of embodied human existence, and in the almost ubiquitous impression that Christians give that we are solely looking forward to a spiritual existence in heaven. If a pre-existent Jesus wrapped himself in a human ‘shell’, then logically Jesus can be raised without that ‘shell’ and still be Jesus. Which perhaps explains why many Christians haven’t really taken on board that the resurrected Jesus has a human bones-and-flesh body now. The incarnation is the affirmation of human existence – God’s statement of intent to redeem it, body and soul. John wrote: the logos became flesh; not Jesus became flesh. Anyway, back to John 12. The only option that is available is that Isaiah saw the logos in the temple, but that’s not what John 12:41 says. The claim that John 12:41 says that Isaiah saw Jesus in the temple is just not true. The Gospel quotes first from Isaiah 53, a passage about the Servant of the Lord. Then from Isaiah 6, the vision in the temple. Both quotations are used to show that the unbelief of the people in Isaiah’s day is fulfilled in their rejection of Jesus the Messiah. These ‘things’ Isaiah said (that’s Isaiah 53 as well as Isaiah 6) because he ‘saw his glory and spoke of him’. That just means that Isaiah foresaw the glory of the Messiah’s day (in the Servant Songs and in Isaiah 7, 8, 9, which follow closely on the temple vision) and that his words are fulfilled in Jesus the Messiah’s life. The assumption that the words ‘saw his glory’ refer to the temple vision has no basis. In addition, there is no textual connection: Isaiah never says that he saw the glory of the Lord in the temple. The account of the temple vision in Isaiah 6 only contains one reference to glory, on the lips of the angelic beings who speak of the glory of God which fills the whole earth. In our new Bible Study series in our congregation, we’re studying the book of James. James’ reasons however are very practical. We feel joy because we know that if we persevere through the trial we will come out of it with increased endurance – we will be more mature as Christians, having proved God’s faithfulness. Our joy sets us up to persevere, and not to give up. We’re not joyful to be suffering, but we are joyful when we realise that as Christians, no suffering can ultimately defeat us, but rather through God’s grace, we come out stronger, better able to stand and to serve. Sporadic posts from a biblical scholar living and working in the Highlands of Scotland. Reflections on creation, theology, the Church, life as a Christian, and some other stuff too. Glory be to the Father and to the Son and to the Holy Spirit; As it was in the beginning, is now and ever shall be, World Without End. Amen.